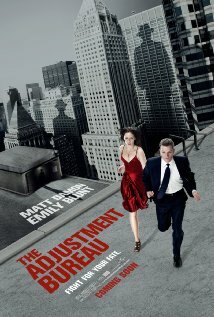 The Adjustment Bureau is not the story of the Adjustment Bureau. It is not an allegory that tells you something you do not already know about free will. What it is, is a well-crafted tale that exalts free will, at the same time subtly disparaging it's impetuous nature. It is a character driven science fiction movie, whose approach to story telling is diametrically opposite to that of Inception. David Norris (Matt Damon) is a successful, brash politician who seems to be on the brink of winning a seat in the US Senate. On the day that he unexpectedly loses the election, he meets a beautiful contemporary ballet dancer Elise Sellas (Emily Blunt). The two hit it off, like a match made in heaven. Unfortunately, as David begins to fall for Elise, he comes face to face with a set of people who seem to hold the invisible strings of fate in their hands. Known as the Adjustment Bureau, they possess singular powers, are able to manipulate luck and are always in the background gently guiding the world according to what is known as "the plan". Because the plan prohibits David and Elise getting together, David finds himself facing insurmountable opposition to his being with her. Eventually David must decide if he can afford to defy those who hold the strings of fate, for what feels like the love of his life. The bureau itself is both the star and the background of the movie. Represented by the field workers who are responsible for executing mundane tasks called for by the plan, the bureau feels like a vast, bumbling, benevolent bureaucracy. Of all the evil empires in the history of cinema, this is probably the closest that Hollywood got to a real evil empire. Where a single infraction does not get the protagonist an audience with the head of the organization and the clueless minions are the only real face of the villain. As could be expected, the story also deals with the nature of free will and it's expression. The good thing is that it never gets too preachy. There are no sermons, just personal epiphanies. But what is really telling is when David realizes that his attraction for Elise may just be because an earlier version of the plan called for it. By choosing to ignore this, David shows free will as an expression of the now, unencumbered by its pedigree. Emily Blunt is the most vibrant part of the movie, the rest of the characters are either politicians or men in black. Screenplay is quick and pacey. The effects are well done, but generally keep out of the way. The Adjustment Bureau does not have much of a shelf life, I wouldn't watch it a second time. But for the time I did invest in it, it was a thoughtfully made movie that respected my time. And I had more than enough invested in the characters and their love story to stay interested throughout the movie. Don't worry about this being called a science fiction movie. It could be just as easily be labelled romance, without upsetting a lot of people. After all, it is your free will to do that.